On 10 June 2011 a Categoy 4 Hurricane and a Weather-maker! On 1 June 2011 the Atlantic hurricane season opened with plenty of disturbed weather over the eastern and southern Caribbean as well as along the coastline of Panama and Central America , which over time began to evolve, move and progress until by 5 June one coaleced around a center of low pressure in the central Caribbean showing some signs of potential cyclonic development, and another cell over quite warm surface waters of the eastern east Pacific off Nicaragua also began to show signs of possible cyclonic development [See 5 June 2011 posting here: “The Caribbean and Esatern East Pacific Flare-up on 5 June 2011”]. 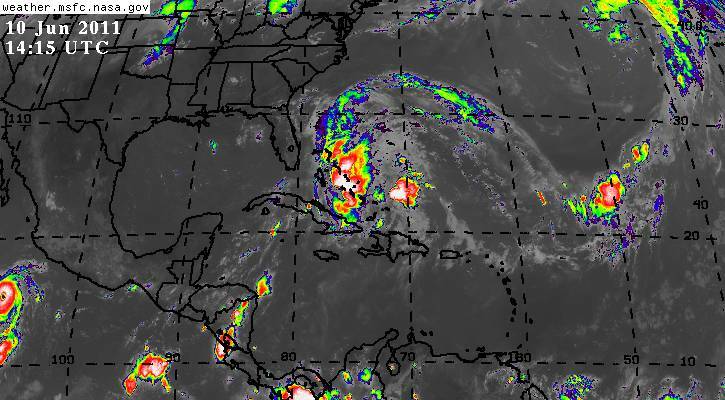 More recently, over the past five days, the Caribbean system has weakened but caused heavy rains, and flash floods as it interacted with the mountains of Cuba, Jamaica and Hispanolia, while moving generally northward toward eastern Cuba and the Bahamas. In the course of these developments, flash floods in Haiti resulted in at least 30 dead and addiitonal suffering for the thousands of survivors of the 2010 earthquake still living in tent cities and makeshift shelters. Meanwhile over in the eastern east Pacific we had tropical storm Adrian form off the coast of Mexico to the southwest of the resort city of Acapulco [See 8 June 2011 posting here: “The Northern Tropics are Acting-up!”], and far away from our neck-of-the-woods large tropical waves generated disturbed weather over the South China Sea just west of the Philippines and west of Mumbai, India over the Arabian Sea. Today, 10 June 2011, there is category 4 Hurricane ADRIAN near the Pacific coast of Mexico some 500 south of Puerto Vallarta, moving toward the northwest and away from the continental land mass. Adrian is the first tropical cyclone of the 2011 East Pacific season that started on 15 May 2011. The satellite view on the left [courtesy of the Navy Research Laboratory] shows a well defined and large storm churning along toward the northwest, which will take it away from land toward the central north Pacific . 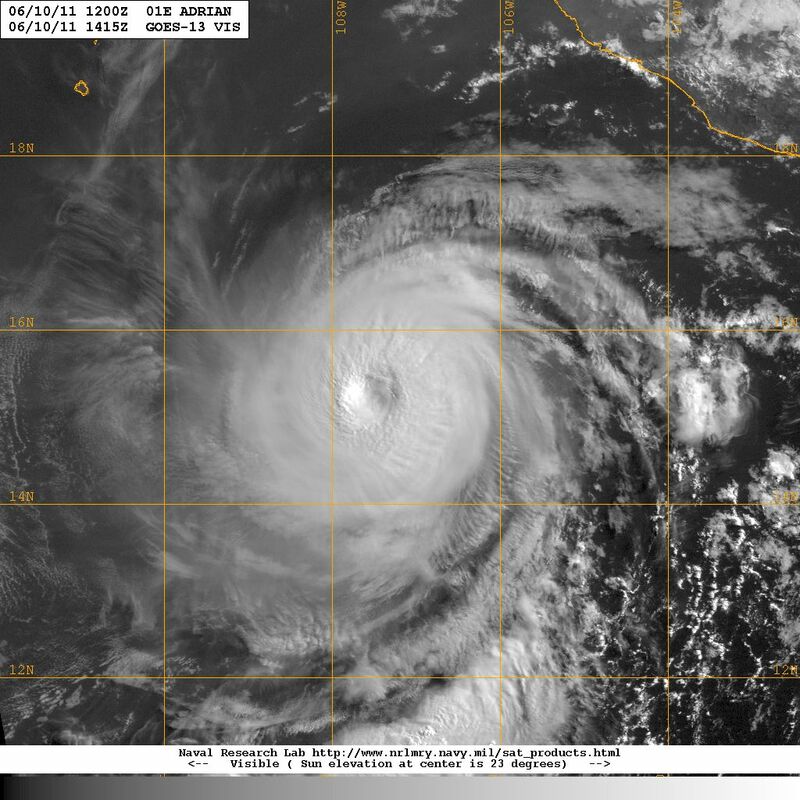 Another satellite view [courtesy of NASA], below, shows a color-enhanced infrared image of Hurricane Adrian with a well defined eye as it moved basically in parallel to the Pacific coast of Mexico in the early morning of Friday 10 June 2011. The main question concerning this system, which is moving into an atmospheric environment ahead that does not favor cyclonic development, is how much it will affect Florida if at all. This is quite an important issue as the Florida peninsula is suffering one of its worst drought of the past 30 years, and a weather-maker like this could bring some much needed rain to the state. Although any rain generated by this system over Florida will not solve the problem, it would at least alleviate some of a current situation that has the waters of Lake Okeechobee at such low levels that no water is flowing naturally through the C-8 canal, and water management authorities have had to use pumps to provide water to the agricultural area south of the lake, while diverting water away from the Calootsahatchee River causing an environmental problem with high salinity, dead fish and flora, and severe adverse impact on tourism dependent activities in Fort Myers and adjacent areas, as well as throught the greater Everglades. Given these problematic issues, there are some in Florida who are wishing for the 2011 Atlantic hurricane season to send a couple of wet hurricanes toward Florida soon, even though the quid-pro-quo might be structural damage and human suffering for some. What a dilemma!! So, what will be next over the northern tropics? Will tropical cyclone activity drive rain toward parched regions enduring severe drought? Or will tropical cyclones only bring damage and destruction to affected areas worldwide? Only time will tell what happens next, we must however remain prepared and vigilant for it only takes one impact to cause a disaster and plenty of human suffering. Be prepared! Pay attention!! Mitigate!! !